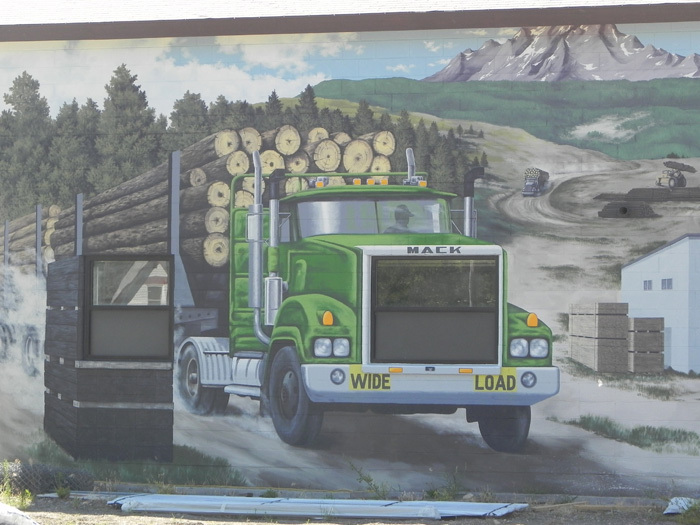 The fourth mural in Forsyth depicts the lumber industry in Montana. Three large windows needed to remain functional in the wall and had to be incorporated into the design of the picture plan. One window became the grill of a logging truck. A large window makes for a large truck in this case. Another window portrays a stack of tie posts, while still another is the open doorway of the lumber shed. The painted open doorway next to that shows the first fire truck used by the local fire department. The north wall of the fire station is adjacent to the Forsyth lumber yard. The mural, sponsored by the Forsyth Hardware & Home Center, relates well with the lumber items in the yard. The painting includes the forklift in action. The mill in the background is the Yellowstone Pine Sawmill, long since dismantled, and is where the artist worked while attending college. The mountains and timbered area suggest the western part of the great state of Montana.